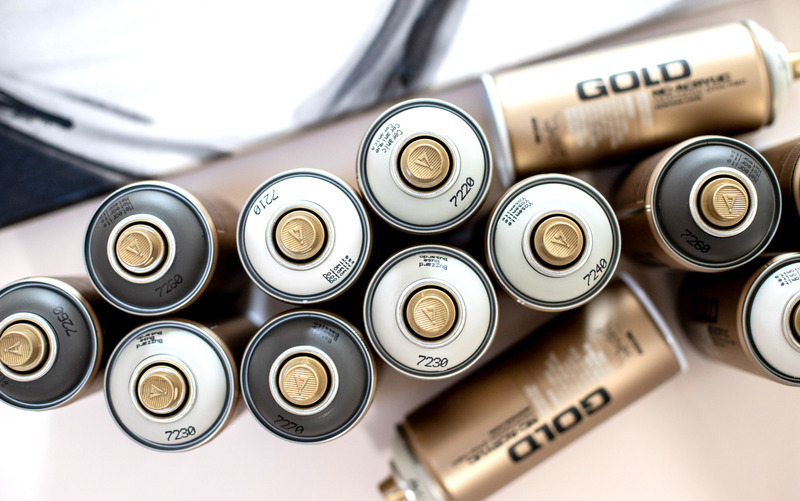 Montana GOLD is the premium, high quality, low pressure aerosol paint for all artistic, creative or general DIY projects. With a unique and extensive color range the Nitro Acrylic paint base offers extremely high coverage and color vibrancy with the flexibility to combine mediums with other materials. Montana GOLD is easy to use, perfect handling for experienced or in-experienced users with a long lasting result that is second to none. Montana GOLD works on many substrates such as paper, cardboard, canvas, wood, concrete, metal, ceramic and synthetic surfaces. It is recommended to check compatibility on a non visible part of your object. Turn can upside down and remove nozzle, allowing safety ring to fall out. Shake vigorously for 2-3 minutes ensuring you can hear the mixing balls moving freely. Replace the cap back onto the top of the can valve and trigger away from substrate to test. If flowing freely you can start painting. Protect object and surrounds from spray mist during application.